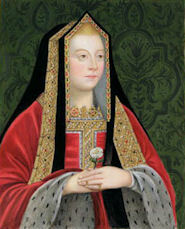 Birth of Henry (later Henry VIII) at Greenwich Palace, sixth child of Henry VII and Elizabeth of York (daughter of Edward IV and Elizabeth Woodville). He became heir to the throne after the death of his brother Arthur in 1502, and became king on his father’s death on 21 April 1509. Illustration: Henry VIII, 1509, by an unknown artist. The Denver Art Museum. The following question comes from Pamela J Butler, one of our friends from the American Branch of the Richard III Society. Did you know the answer? 1. 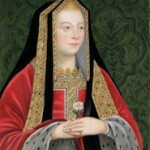 She lived in the late fifteenth century and into the sixteenth century for a few years. 3. Her father was a powerful ruler, but a bit on the licentious side. 4. Her family used her as a political pawn to further their own ambitions. 5. She died in her late thirties after giving childbirth to a girl.